Aunie Sauce: Oh, you like my glasses? They were free. I do do product reviews. I love to feature it in a post, in photos, or as part of my outfit. But generally, I don't love product reviews. I don't really love reading them either. But that's just my honest opinion. I would never, never endorse something I don't believe in. And once in a while, I stumble upon a product that really impresses me. And that's when you see it on my blog. The glasses I'm showing you today? I get compliments on them everywhere I go. And I want to tell everyone and their sister, "They were free! You can get them, too!" That, my friends, is when a product review comes into play. you had better say something. Today, I'm using my words for good. but they sure may save you some money. And really, who doesn't love a good pair of glasses? I've told you before that I have an astigmatism. Without glasses, that little astigmatism results in me squinting all the time. I'm always wearing my glasses. Up until recently, I only had one pair. A lovely purple, plastic-framed pair from Michael Kors. A few weeks ago, I was contacted by Firmoo.com to review a pair of glasses. 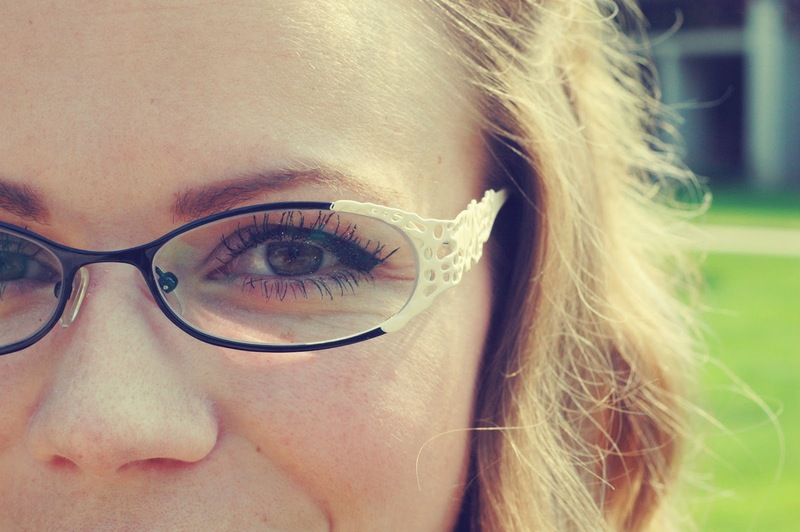 Firmoo is an online retailer that sells hundreds of pairs of glasses for really affordable prices. To be honest, I think everyone who wears glasses needs more than just one pair. So I immediately said yes. 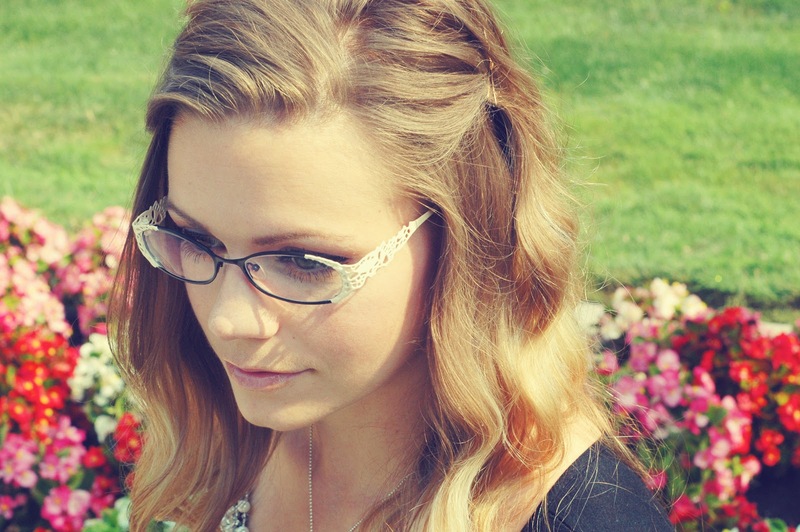 I picked out these frames (which have since been discontinued, bummer, I know). It was actually really hard to pick... there were so many choices! My glasses arrived within a week and a half and I was wearing them that same evening. To be honest, Firmoo's frames and lenses are not expensive. The ones I picked were $28.50. Total. In other words, very affordable. and I'm really impressed with the quality of these glasses. So impressed, in fact, that I wanted more. Firmoo told me they had a program where first-time buyers get their first pair of glasses free. Naturally, I could have told you this, promoted it, and went along my merry way. But I don't promote things that I don't know or don't believe in. I went to Firmoo.com and made my very own order. They didn't pay me to do that. They didn't ask me to do that. I got a pair of glasses for free. And since just two pairs isn't good enough, I ordered a third as well. So... you probably want to know how to get that free pair, right? Browse their glasses selection. You can browse by frame type, color, shape, etc. You can even do a virtual try-on (which REALLY helped me make my decisions). Once you find the pair you like, click on them. I picked these ones. MAKE SURE you are on the page of the pair you want for free. This is really important... and I messed it up my first time. I had to deal with customer service about it and they were really helpful. Underneath the photo of your glasses, you will see a link that says this: "New customer? Get your first pair free now." Click that link. It will give you the option to "Share It & Get It Free." I chose to share mine via Twitter. As soon as I tweeted the message about Firmoo to my tweeps, the website popped up a code for me to use. The code was also sent to my email and I had to use it within 3 days. I immediately went back to the site, selected my peach pair, added the yellow pair to the cart, filled in my prescription information, added the $2 anti-glare to each pair, and submitted my promo code. Just pay and you're done! Just so you know, my order total (with shipping) came to about $37. For two pairs of glasses, lenses, anti-glare, and shipping. Remember those Michael Kors frames I told you about? $400 with the frames, lenses, anti-glare (which was about $100 at my eye doc's office) and the appointment. PS> They also have sunglasses! Oh! I'm loving the frames you chose.. those are so unique! I absolutely LOVE my Firmoo glasses I got, too! Free's my favorite price! I really need to use Firmoo.com the next time I buy glasses. I love them! SO MUCH more affordable than the eye doctor's office! SHEESH! I'll probably do what you did and buy some fun pairs to change things up. It would be any different than buying a new piece of clothing! Those are sooo cute!! And I just love your shirt too!! PS-- ME = NOW A REPLY-BLOGGER COMMENTER!! THOSE GLASSES ARE SOOO SUPER CUTTTEEEEE! And YES I am going to channel MY inner sauce-Y gal and order the leopard pair you suggested!!! I have been looking for glasses lately and have looked at Glasses USA because a blogger from Latter Day Style did a review on a pair she bought. I was also thinking about America's Best, but decided against it. I love the glasses! They're so cute! Thanks for that info! I had no idea. I wish they still had those glasses in stock. Love them!! Love all of these glasses! I definitely need a new pair. Love those glasses - super cute! This is amazing. I have to wear glasses for driving, but also need them for watching TV, spotting people in the bar, recognising faces at a distance, that malarky. Having just moved to the USA, this is exciting news for a speccy-lady to hear! Thanks Aunie! I just bookmarked it, I really need prescription sun glasses! I can't believe I can get them for free! Girl, you just saved me 300+ dollars! Yay! Thank you for posting this! This is perfect timing! I don't wear glasses, but my sister does and she's been complaining about needing a new pair, but not having the money to get some. She'll absolutely love this! And I love all the frames you got! So unique and pretty! I have my firmoo pair on it's way! I was super excited to do the review! I love the ones you picked. I wasn't that daring, since I'm not even used to wearing glasses. Oh my goodness how did you know I was about to buy new glasses! I can't believe these prices this is AWESOME! Ooh interesting! I need a new pair actually. I usually wear contacts, but in the evenings I'm still wearing my 5-year-old glasses that are a totally old prescription. I might have to try this place! woohoo! I just ordered two pairs myself! I am a glasses junkie and this is probably my 6th and 7th pair (though I only wear one right now). Thanks for the info! I love your glasses! I'm so glad you shared this!